On New Year’s Eve in 1972, a plane carrying baseball star Roberto Clemente crashed about a mile off the shore of Puerto Rico. The right fielder for the Pittsburgh Pirates was en route to Nicaragua to deliver aid to earthquake victims. He was 38 years old. The story of his life and his humanitarian efforts are told in the “Beyond Baseball: The Life of Roberto Clemente” exhibit, which opens Saturday at the Orange County Regional History Center. Clemente “was a Hall of Fame baseball player, but everything he did off the field that made him that special person is what this exhibition takes a good look at,” says Michael Perkins, the history center’s curator of exhibits. 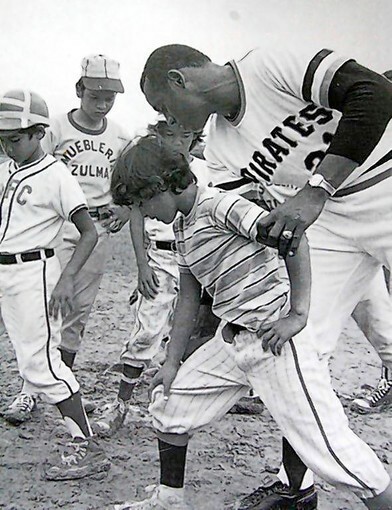 Clemente, who played his entire 18-year Major League Baseball career with the Pirates, kept his native Puerto Rico in mind. One of his Caribbean projects was the creation of Sports City, an athletic complex in Carolina, Puerto Rico, which develops skills in underprivileged youth and discourages drug use. He also worked for recognition for his fellow Latin American players. After his death, he was voted into the Baseball Hall of Fame. After the crash, the New York Times reported that Clemente had heard that earlier supplies had fallen into the wrong hands, and he was going to Nicaragua to try to keep that from happening again. The Times quoted a TV producer as saying that Clemente didn’t just lend his name to the earthquake-relief effort. “He took over the entire thing, arranging for collection points, publicity and the transportation to Nicaragua,” he said. The “Beyond Baseball” exhibit has relevance in Orlando for reasons beyond Clemente’s caring nature. Central Florida’s large Puerto Rican population gives the exhibit extra resonance. Central Florida’s history with spring training gives the exhibit another tie to the community. The story is told primarily through large visuals and several stories. Among the images is a photo of Clemente with New York Mets manager Yogi Berra before a spring training game in St. Petersburg. “Beyond Baseball” is a Smithsonian traveling exhibition. The history center has supplemented it with items from the Baseball Hall of Fame and the city of Pittsburgh. But mostly, it’s the story of Clemente. •Steve Blass, a Clemente teammate and broadcaster for the Pittsburgh Pirates, will be at the history center Saturday for a screening of the 1975 film “Roberto Clemente: A Touch of Royalty.” An autograph session will follow. Admission: $20 for nonmembers, $10 for members. Reception starts at 6 p.m., program at 6:30. Reservations: 407-836-7010. •Graffiti artist Hector “Nicer” Nazario will paint a mural of Clemente in Heritage Park in front of the history center from 11 a.m.-3 p.m. on Jan. 28. Children will be selected to paint three sections of the work, which will be added to the exhibit. •”Touch of Royalty” also will screen at 1 p.m. and 3 p.m., Feb. 19. It’s included in admission.